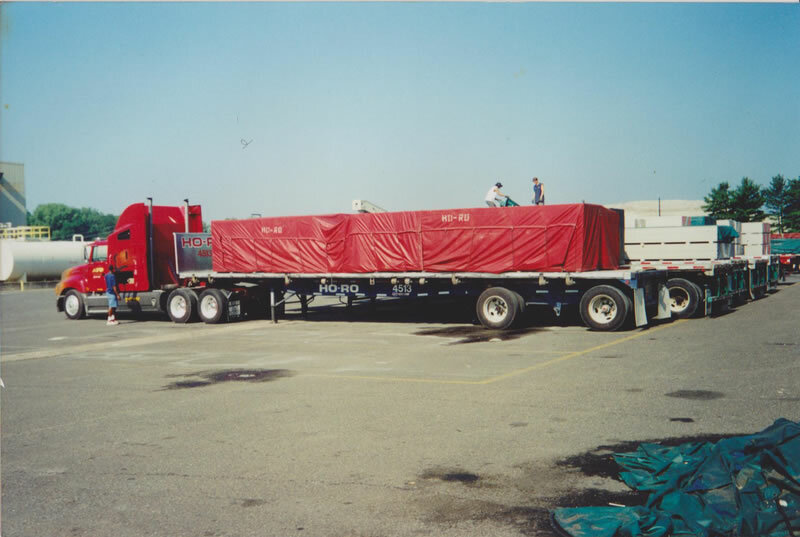 Truck Tarps – Harold F. Fisher & Sons, Inc.
No matter what it is, if it is carried on a truck or trailer Fisher and Sons can supply a cover for it. Remaining a true tarp shop we do not carry “systems”. We make tarps and covers, even replacement tarps for “systems”. We stay with what we know and leave the rest to others. 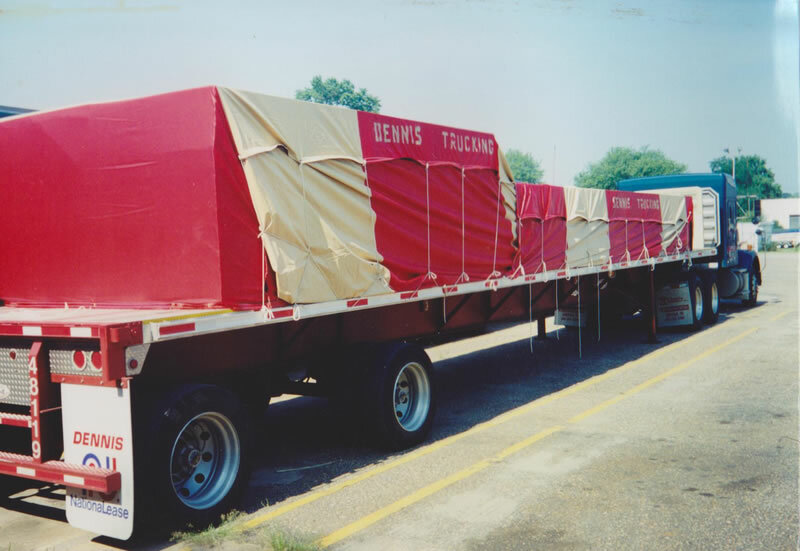 Be it an oversized load or just a little dump cover we make it the best way we know how. Using the right material for the job is important, and we know what works best. Using different combinations of material to lighten the weight but not lose strength is a method that we have done for over 25 years, well before any other tarp manufacturer. We are always looking for a way to improve on the way tarps are used. When Standard sized tarps will not do or if the customer has a special way he likes his tarps we are more than willing to accommodate that need. With an array of machinery at our disposal and access to a wide range of materials, we can make a cover or tarp for just about any use. We look forward to the challenge of the custom request. Protection for Building Materials, Steel and many other products that are carried on Flatbed Trucks and Trailers. 10,14,18 and 22 ounce Vinyl Coated Polyester Material. Double Stitched Hems and “D” ring bands. Brass Grommets spaced 24″- 30″ apart with web reinforcement. Extra rows of grommets if needed. With rows of grommets at the bottom and 4′ up on each side this is the “do-everything” of Steel Hauling. An extra row of grommets can be added at 2′ at an additional charge. Cross rows at each end is also an option in which a tarp can be fabricated to fit each Truckers specific need. Two 6′ semi-circles joined by a 5′ sheet of material, the Coil Tarp is the lightest, quickest and easiest way to cover a steel coil. Grommets around the bottom and 3′ up on all 4 sides provides ample tie down points. Two chain slit are provided on each flat side. Used for covering sheetrock and plywood, the 6′ drops have three rows of grommets. 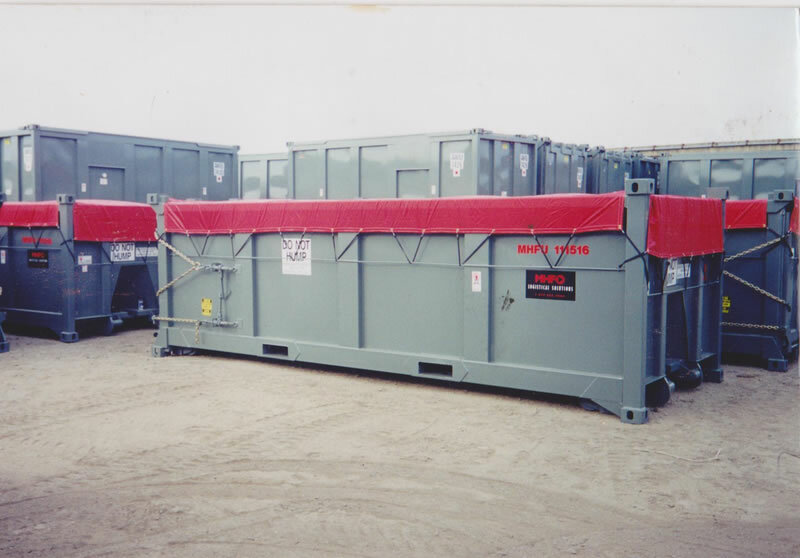 The 9′ 6″ x 6′ end flap provides plenty of wrap around to seal in the corners of the load. A 12′ center section of 18 ounce material provides plenty of durability where it needs it most, while 10 ounce sides allow for a lighter tarp. When hauling lumber or insulation these 8′ drop tarps provide durability with out the excessive weight. As with the Building Material Tarp, the Lumber Tarp has 18 ounce material on the center 12′ and 10 ounce material on the lower sides. Rows of grommets are at the bottom, 2′ and 6′ 6″. Has a 9′ 6″ x 8′ end flap. Extra rows of grommets can be added or “D” Rings can be substituted for grommets. For specialized hauling the a machinery tarp can be fabricated in a wide range of sizes and configurations. Grommets are around the perimeter with rows of “D” Rings placed on all four sides. Combinations of 18, 14 and 10 ounce material can lighten the weight without loss of durability. Covers tree and shrubbery while being transported. The 70% windscreen provides excellent protection for leaves and small limbs. Rows of grommets are around perimeter and 24″ up on each side. The nursery tarp can also be fabricated in other sizes.